You may recall that back in May I teased a new project. With art from the profoundly talented Alex Cormack (Future Proof, I Play The Bad Guy) & letters by Tyler James (The Red Ten, Epic), Find is my own writing début in direct market comics. Published by the excellent Comixtribe, home to great titles such as Scam, Oxymoron & current horror sensation And Then Emily Was Gone, Find will be hitting stores in January 2015, & you can head out & pre-order it now from your lovely local comic book shop using Diamond code NOV141188. 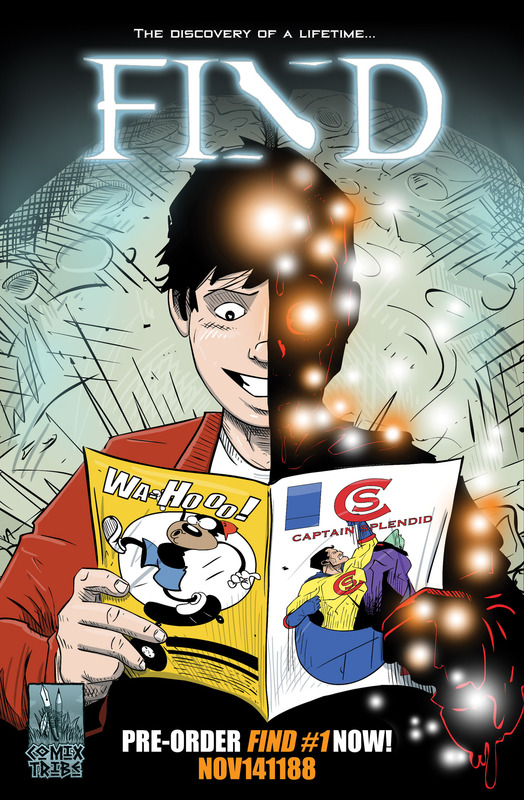 Telling the story of a young boy who finds a strange, otherworldly object one night & embarks on an incredible adventure, Find is a all-ages one-shot in the tradition of 80s/90s ‘coming-of-age films’, & an ode to the boundary-defeating power of comics. Whether this is the first time you’ve encountered Alex’s or my own work, or if you’ve already enjoyed the likes of Exit Generation, Future Proof or the many quality titles Comixtribe put out, I really hope you like the look of Find, & will consider pre-ordering the book from your local comic book shop. & to help you do just that, Alex & Tyler have put together the natty pre-order handbill below (click on the picture for a larger, print-friendly image)! To make sure you don’t miss out, print the above image, & either take it to your regular comic shop or find one near you via this link, & have them order in your very own copy (or copies, if you fancy) of Find! You can even email them the image (it saves trees & shows off you’re good with computers…), & please don’t hesitate to share it with your friends, either; they’d want to know! But in all seriousness; with books such as ours, pre-ordering really is very important. Alex, Tyler, the guys at Comixtribe & myself have put a lot into Find, & I’m really proud of what we’ve put together. However, unlike those books featuring characters such as Batman or Spider-Man, or even those established independent titles like Walking Dead, ours isn’t a comics retailers will likely be looking out for in their catalogues, so for them to take a chance on us they need you to let them know you want them to order it in. So everyone involved would be really, really grateful if you would be so kind as to support us & pre-order; it’s the BEST way to back new comics, & we’d be humbled & grateful. I’ll be making loads & loads of noise about this over the coming weeks, but you can catch all the relevant details on a special page I’ve set up on the site HERE once new blog posts overtake this one. Oh, & one last thing; Find will also feature an exclusive pin-up by Iain Laurie & Megan Wilson, art team for the magnificent And Then Emily Was Gone, the trade paperback of also hits stores in January 2015 (Diamond Order Code NOV141187), so make it a Comixtribe double, & snap that up too! Lots of news in the build up to Thought Bubble 2014 coming up from me over the next week, so keep checking back (maybe we’ll even have some Exit Generation #4 news; you never know…).